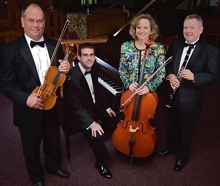 Aurora Musicalis is a diverse chamber music ensemble composed of members of the North Carolina Symphony and other distinguished artists. In keeping with our name which means “Musical Lights” we present a constellation of music for all occasions, including mixed quartets for serious concerts and string quartets for special events. Founded by Principal Clarinetist Jimmy Gilmore and Associate Principal Cellist Elizabeth Beilman, the group’s core includes Concertmaster Brian Reagin, Assistant Concertmaster Rebekah Binford and pianists Kari Milller and John Noel. Copyright © 2009 Red Avenue. All Rights Reserved. Design inspired by Free CSS Templates.